Our perfect route for seeing all the best of the vast region of Patagonia with a flexible schedule and at great value. You travel at your own pace, but benefit from our years of experience as we organise car rental, accommodation, hiking in Torres del Paine and day trips like a yacht crossing of the Beagle Channel. Drive along the "Road of the 7 Lakes"
Arrive at the Santiago International airport and transfer to the Orly hotel in the scenic Providencia area. Day 2: Transfer to the airport, flight to Temuco (LA231/10:20-11:45). Collect hire car at the airport and drive towards southeast to Pucón, on beautiful Villarrica lake, at the feet of Villarica volcano. Accommodation for 2 nights at the hotel Plaza Pucon. The region has two national parks: the Huerquehue and the Villarrica. The latter is the home of the 2,847-meter-high volcano, one of the ten most active volcanos in the world, which has permanent smoke that may be observed from the shell. In the winter, ski and other winter sports are practiced on its slopes. In the summer, adventurers may climb to its crater. The Trancura River and its rapids, the hot springs and the cultural richness of the area turn Pucón into one of the most visited cities in southern Chile. Day free to visit these areas: Villarica volcano and Huerquehue National Park. Today you cross the border to Argentina through the Mamuil Malal pass, just at the feet of the imposing Lanin volcano (3779m). An ancient Araucaria forest will surround you on the way. Accommodation for 2 nights in San Martín de los Andes at the Hostería La Raclette. We suggest to driving alongside the beautiful Lacar lake along its northern shore line until arriving at Hua Hum. The trip continues southwards along "The Road of the 7 Lakes", a fantastic drive passing Lacar, Hermoso, Villarino, Falkner, Correntoso, Espejo and Nahuel Huapi lakes. 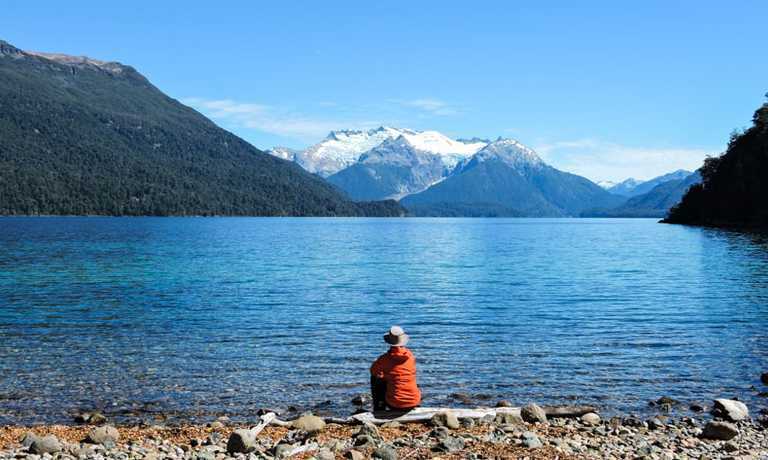 Lunch can be taken in Villa La Angostura, a beautiful mountain village on the northern shore of Nahuel Huapi lake. In the afternoon arrival into Bariloche, also called the "Swiss Argentina" because of its crystalline lakes, forests and snow covered peaks in its surroundings. Accommodation in the exclusive area of Llao-Llao for 2 nights at Bellevue B&B, with a marvellous view over the huge Mount Tronador and Moreno lake. Excursion on your own along the so-called "Small Circuit" (Circuito Chico), on Av. Bustillo until you reach Llao Llao, where you continue to the Panoramic Point with a wonderful view of the Andes and several lakes. You have also the chance to ascend with a chairlift to Cerro Campanario to enjoy the beautiful surroundings of Bariloche from high up. Drive southwards to El Bolsón, where it's possible visit a famous beer brewery, then head on through Los Alerces National park to Esquel, a fly fishing paradise. Stay overnight at B&B Canela. The trip continues southwards, crossing the Chilean border at Futaleufu, along the Carretera Austral through sub-tropical rainforest, a road lined by giant ferns and wild rhubarb leaves, until you reach Puyuhuapi, a small harbour lying on the Ventisquero fjord, surrounded by the Queulat National Park. The inhabitants are principally descendants from German immigrants, who have built a flourishing trade here and a carpet weaving industry which continues to prosper to this day. Stay 2 at Pangue lodge on Risopatron lake. A short road trip and a two-hour hike through the "Valdivian" forest, at the end of which one is suddenly rewarded with an incredible view of a hanging glacier, which seems to appear out of thin air from above, bulldozing its way down through this thick forest and coming to a halt against a vertical rock face. With some luck we may experience the thunderous reports of huge blocks of ice breaking free and crashing into the depths below. Same overnight stay as previous day. Today you continue southward until reaching Coyhaique. On this stretch of road we notice the forest becoming denser and more humid in the Queulat National Park, which eventually turns into a more open agricultural region. Overnight stay at El Reloj hotel. Trip continues along the Carretera Austral, through wonderful meadow landscapes up through a pass and past Cerro Castillo, impressive because of its shape (Castillo means castle). To the right lies the Hudson Volcano, which covered wide tracts of land in both Chile and Argentina in volcanic ashes during the last eruption in 1991. Stay 2 nights near Puerto Guadal on the huge General Carrera Lake at the peaceful Terra Luna Lodge. Puerto Guadal lies in a bay renowned for its exceptional micro-climate that allows people to visit the area all year round, facing the Northern Patagonian Icefield and its impressive glaciers Leones, Nef and Soler, Laguna San Rafael and Mount San Valentín (4058m), Patagonia's highest peak. Some kilometers to the south you can follow the wonderful Río Baker, a fisherman's paradise, to Lake Cochrane, where it's possible to visit Tamango Nacional Reserve dedicated to the protection of "Huemules" (Andean dear) and Cerro San Lorenzo (3706m). To the North you can visit the "Capillas de Mórmol" , incredible marble caves formed by the erosion of the lake's waves, as well as Glaciar and Exploradores Valley, in between many other Natural treasures. After breakfast, early in the morning, drive east back towards Argentina following the wonderfull lake road to Chile Chico at the Chilean border, then crossing to Los Antiguos in Argentina, heading on to Perito Moreno village. Here you'll go southwards along the legendary Ruta 40 to Estancia Cueva de las Manos (prehistoric cave paintings). The Cuevas were a sacred site for the Tehuelches and their ancestors and we can find paintings of about 9000 years old here, mainly of hands. Stay overnight at Estancia Cueva de las Manos. In the afternoon visit the Cuevas de las Manos, driving just 17 km in the estancia's grounds to the gorge. An undulating hike takes you to the site. A narrow path from the ranger's house parallel to the river allows access to the different shelters and caves. According to experts, the splendid cave paintings belong to at least three different periods of styles on this archeological site, from 7300 B.C. to 1000 A.C.
Once again on the Ruta 40, you head 110 km southwards, then West approaching the Andes and the huge snow covered Cerro San Lorenzo. Stay 2 nights with meals included at Estancia Menelik. The nearby National Park Perito Moreno is by far the loneliest and nicest park in the country, only very few visitors can be seen in the summer. An exciting full day wildlife safari through the Park on your own, deep into the park's wilderness. You can easily observe guanacos, choiques (rhea americana), red and grey foxes, patagonian hares, flamingos, Magellan Geese, Condors, the puma (felis concolor) and huemul deer (American deer) are very difficult to be seen. During the trip you will see the Cordillera de los Andes and a complex lake system, which includes Lake Belgrano, Azara, Burmeister, and Lake Nansen. Hike along Belgrano Peninsula, where you learn about how Guanacos behave as there are hundreds of them around the hilly peninsula. 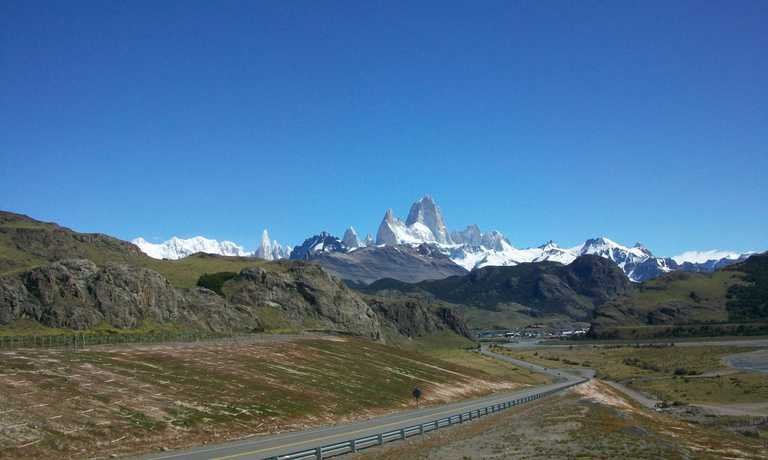 After breakfast early in the morning and once again along the Ruta 40, you head southwards to El Chaltén. This part of the trip leads through the (by far) vastest and loneliest region in Patagonia, only interrupted by some huge estancias, without seeing a single vehicle on our way. In the evening arrival at El Chaltén, where the legendary Mount Fitz Roy and Mount Torre are part of one of the most amazing mountain regions in the world. Stay 2 nights at Hostería El Pilar. Hike on your own to Laguna de los Tres, enjoying an incredible view of Mount Fitz Roy along the whole trek. After 3 to 4 hours you reach the lagoon which lies at the foot of Mount Fitz Roy, offering a breathtaking close up view of huge granite peaks soaring above us. Overnight as before. Hike on your own to Laguna Torre, the base camp for the ascents to Mount Torre, one of the most difficult summits in the world. The view is just overwhelming over all of those ice covered peaks and huge glaciers. Overnight as before. In the afternoon drive to El Calafate on Lago Argentino lake and stay 2 nights Hostería Los Hielos. Visit the famous Perito Moreno Glacier, one of the highlights in Southern Patagonia. Being the only glacier in the world which is permanently advancing, it has been declared by UNESCO a world heritage. Overnight as before. 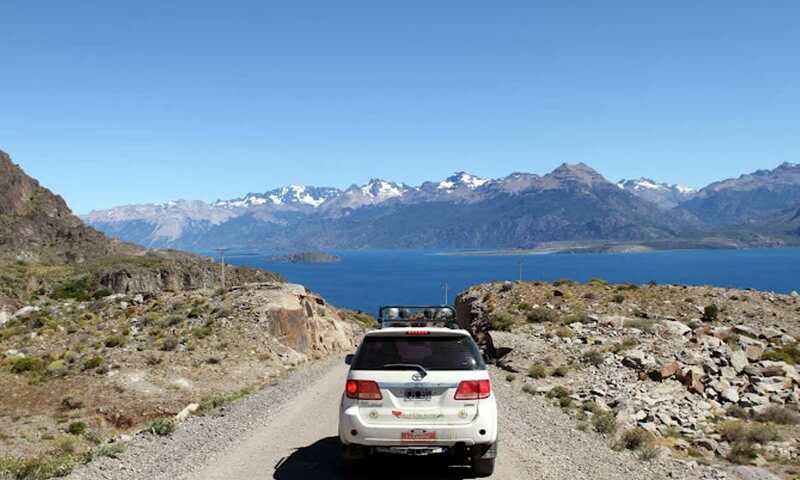 Drive and cross the border at Cancha Carrera - Cerro Castillo towards Chile until reaching Torres del Paine National Park. This area is the absolute culmination of what Patagonia has to offer mountain loving visitors. Beautiful mountain massifs, huge glaciers, innumerable glacial lakes in a wide variety of colors and very rich fauna will leave one with deep impressions. Fauna: guanacos (of the llama family), foxes, small ostrich, black-necked swans, armadillos, skunks and throughout the mountains various bird types, e.g. condors and eagles. Drive through the park until reaching the 'Las Torres' area. Here you stay for 4 nights at Las Torres hotel. Visit the park on your own. Hike to Grey Lake (little hike of 2 hours to the viewpoint of the bay along the peninsula). Roundtrip through the Northern part of the park and visit Pehoé Lake, Salto Grande (best view to the "Cuernos" and French glacier, Nordenskjöld Lake and Laguna Azul, where one can particularly well observe the droving of animal life on the steppes, and the best view of the "Torres". Day 25: Drive south via Puerto Natales to Punta Arenas. Stay overnight at Rey Don Felipe hotel. Today you return to Argentina via Punta Delgada (Porvenir is too windy and often closed), where you take a ferry to cross the Estrecho de Magallanes. The trip continues towards San Sebastión border into Argentina, then heading on to Rio Grande staying overnight at Estancia El Rolito. In the morning we recommend visiting the coast nearby and the Bay of San Pablo. In the afternoon drive to Ushuaia, the southernmost city in the world. Tierra del Fuego features mostly steppe landscapes but shortly before Ushuaia, an as yet unaltered natural beauty makes its appearance, with original southern-beech forests, lakes, rivers and mountain chains. 2 nights accommodation at Yamanas hotel on the Beagle Channel. In the morning take an excursion on yacht along the Beagle Channel to Isla Lobos (Sea Lion Island) and Isla de los Pajaros (Bird Island). With some luck the Darwin Chain will be visible in the background. In the afternoon take a visit to the Tierra del Fuego National Park down to Lapataia Bay, the end point of the long Pan-American Highway. In this untouched and wild nature of Tierra del Fuego, one encounters countless wild geese, cormorants and other fauna. You can do many short hikes in the park and along Lake Roca. Drive back to Punta Arenas taking the same road as before. Stay overnight at Rey Don Felipe. Return the car at the airport and fly to Santiago de Chile (LA280/15:50-20:15). Stay for 2 nights at the Orly hotel. Price from USD $8,288 per person, based on a group of 4 people. Please get in touch for information. This trip can run as a group trip, with prices starting from $8,288 per person for a complete group. If you are looking to join a group or you are a solo traveller we will help to form likeminded groups of travellers. Please let us know your travel plans.